Dandelion (Taraxacum officinale) - Attunes you to the essence of the sun to upgrade the functioning of your liver and gallbladder systems. Assists you with clearing and expelling toxic imprints. I AM essence of the sun aligning the liver and gallbladder systems with clear and healthy functioning. Dandelion grows just about everywhere in the world. Even though many people regard dandelion as a weed, it is one of the most valuable medicinal herbs. 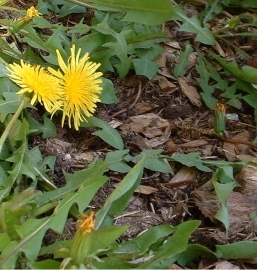 Dandelion root is a very effective detoxifying herb. It works primarily in the liver and gallbladder to remove wastes from infection or pollution, that can become toxic if they build-up, and stimulates the kidneys to eliminate the waste. One benefit of cleansing the liver and gallbladder is to reduce allergic reactions. Clearing the liver and gallbladder can also benefit conditions of the large intestine - such as constipation, conditions of the skin - such as acne, eczema and psoriasis, and inflammatory conditions – such as arthritis. Clearing the gallbladder can also help to prevent or eliminate gallstones. Dandelion’s diuretic effect can also help to eliminate fluid retention and reduce blood pressure. In the spring, the flower can be made into dandelion wine and the greens can be eaten fresh in a salad or cooked. They are rich in vitamins A, B2, C, E, and minerals of boron, calcium, iron (leaf & root), magnesium, manganese, phosphorus, and potassium. Dandelion’s combination of being a liver tonic and rich in phytohormones makes it a wonderful herbal tonic for menopausal symptoms like hot flashes. Use Dandelion Flower Essence when you have problems with your liver or gallbladder, or experience old anger and rage that are turned outward towards others or inward towards yourself. Use Dandelion Essence when you have difficulty planning and organizing your life and putting into action what you have planned. Dandelion Flower Essence helps to clear the energetic patterns of addictive behaviors such as alcoholism and chemical sensitivities that have become imbedded in the liver and gallbladder. It supports the release of emotional and physical imbalances that feed hormonal imbalances such as menopausal hot flashes. Dandelion flower essence attunes you to the essence of the sun to upgrade the quality of how you live. By attuning the liver and gallbladder to the radiance of the sun, it increases the frequency of the many functions performed by the liver and gallbladder, and promotes deep cleansing of toxic imprints on the physical, emotional and mental levels. The imprints may be genetic, from present or past life experience, or from environmental toxins. As Dandelion Flower Essence does this energetic work, it assists the body to function at the 5th dimensional level. Supporting the energetic liver and gallbladder systems strengthens digestive and hormonal processes. While the essence was being made, crystals of amber, bloodstone, drusy quartz, green calcite, icosahedron cut quartz, malachite, smokey quartz and wulfenite were placed among the plants with the storage (mother) bottles. Amber aligns the subtle bodies with the physical bodies, transmutes negative energy into positive energy, and emits a sunny and soothing energy that calms and enlivens the disposition. Bloodstone has been used to neutralize and eliminate toxins from the body, and it helps to facilitate clear thinking. Drusy quartz crystals help to energize and stabilize your subtle bodies. Green Calcite brings freshness and vitality to your body and spirit, and helps you listen to your heart's wisdom. Icosahedron cut quartz has 20 (5X4) equilateral sides. It is a bridge between the 5th Dimension - the entry into the unified Spiritual realms - and the 4 cardinal directions (N, S, E, W) on Earth. Malachite burns through emotional fog, and helps you use your power in a constructive creative manner. It restores strength and vitality by clearing and stimulating the flow of life force in the physical, emotional, mental and spiritual subtle bodies. Smokey Quartz gently dissolves negative energies and emotional blockages and allows positive frequencies to enter. It can help you feel more engaged with the world and more capable of creating your own reality. Wulfenite stimulates the solar plexus chakra and is associated with the physical sun and our inner sun. It helps you to acknowledge your shadow side without becoming resentful or guilty, and helps you feel inspired and energized so pessimism and self-defeating attitudes can be overcome. The actions of the crystals inform the way this flower essence seats into the physical body. While this essence was being made, the sound of spirit song through Diana’s voice was imprinted into the essence.